Like many other security software companies, Avast is offering both a free basic version of their software and a commercial advanced version that comes with extra features. Avast Internet Security is the companies’ flag ship product that includes all the features of the free and pro versions of their product plus a firewall, antispam protection or identity theft protection. The German computer magazine COM is currently running a giveaway of avast! Internet Security. The promotional web page is accessible by anyone. 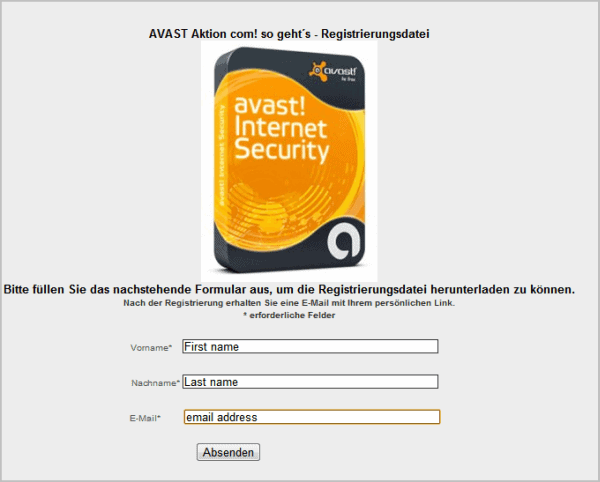 While only in German, it provides a license that works with English versions of Avast Internet Security as well. Here is how you can get your free license of Avast Internet Security. Start by downloading the latest version of the security program from the official website. The link points to the English version of the software. I have not tested other language versions, they may work as well. Go to the promo page and fill in your first name, last name and email address. You will receive a license download link in an email once you click on the send (Absenden) button. The license file is zipped which means you need to unzip it first. Make sure you have Avast installed before you click on the License com! so geht´s.avastlic file. A click on the file registers the program. You can alternatively open Avast Internet Security and load the license under Registration Options from within the program interface. The license itself expires April 2012, which means you get about nine months of free use from this marketing opportunity. You can post your suggestions and reviews about this post in comments....! !